Taking in three of London’s most central parks, covering some of the same ground as the Virgin London Marathon and the Bupa London 10k, the Royal Parks Half-marathon is an iconic – and still relatively new – entry in the capital’s racing calendar. The first Royal Parks Half-marathon was run in 2008, by 2010 it had become so popular that all race spaces were filled within hours of the online entry system becoming available, and for 2011 a new ballot system was implemented to make entry fairer. While the London Marathon and the Bupa 10k have around 35,000 runners each crowding the streets, the Royal Parks Half-marathon is a more intimate affair with just 11,000 runners toeing the line. The first two miles take runners through Green Park, past Buckingham Palace and up to the Houses of Parliament. At this point the roads are wide and should allow the runners to spread out through the initial surge of the race, although the combination of adrenaline and slight downhill trajectory may encourage some to start too fast. Once past the second mile marker, runners head across Westminster Bridge for the first turnaround point. If you’re in the main throng of runners (anyone crossing the finish line around the 2-hour mark is likely to be in the busiest part of the race), this could get congested quickly, so try to keep to the left-hand side of the course as soon as you hit St James’s Park. The route then takes runners along Victoria Embankment, passing the London Eye and ending with the second turning point at Temple. Again, if you’re in the main crush of runners keeping to the left as early as possible is likely to secure you the most efficient u-turn. Between miles 4 and 6 you start your climb back to Hyde Park. There are no prolonged hills on the course, but you will notice the slight incline up Constitution Hill (which you ran down in mile 1 – like an inversion of Newton’s laws). 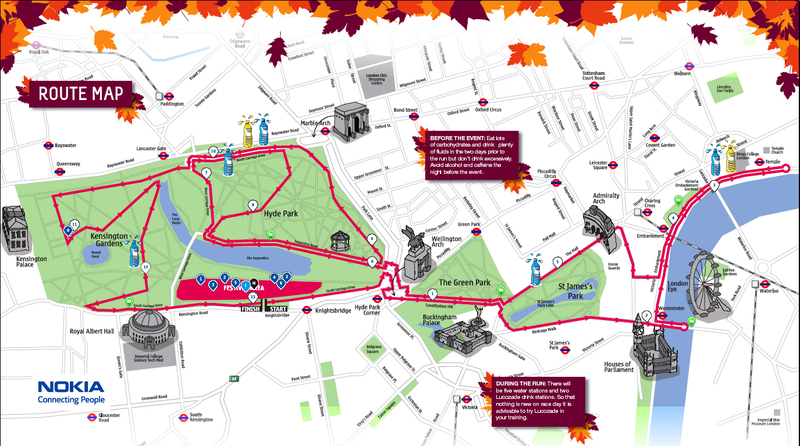 The rest of the race takes place in Hyde Park, but there are two sides to the park. For miles 6 to 9 the park is mostly flat – if somewhat winding and with narrower paths. But come miles 10 to 13 you’re the other side of The Serpentine, where in places there are short but sharp descents and ascents. The most prominent of these comes after the 10-mile mark when you follow a sharp downhill with a gentler but longer climb. As mile 12 passes, largely on a downhill, you will come to the final sharp turn of the course before heading past the Royal Albert Hall and on to the finish line. If you’re planning for a fast last mile, be prepared to try to regain the momentum after that last turn, otherwise the outskirts of the festival area should be your sign to start winding it up. The race is well-supplied with energy drinks (there are two Lucozade stations at miles 3 and 10) and the poshest water stations you’re likely to come across (not just water, this is lovingly bottled water from M&S at miles 3, 5, 7, 10 and 12). On top of this, it should be a great atmosphere and the parks should be beautifully autumnal. If you’re looking for a half-marathon training plan or some last-minute race guidance you might want to have a look here. I was cheering people on today from the 6-mile point and it occurred to me that the course was probably a lot friendlier and less hilly than the Great North Run, which I battled my way through for the first time this year. Might well register for the Royal Parks in 2012 after reading this, so thanks for the useful post!